Discernment ministries are often considered thankless ministries because most people ignore or try to silence them. It is human nature to want to avoid confrontation. Most people desire the life filled with puppies and rainbows that preachers like Joel Osteen sells every week. There is a reason however, why Paul laments how quickly the Galatians had abandoned the Gospel that saved them. It seems unfathomable to his mind. 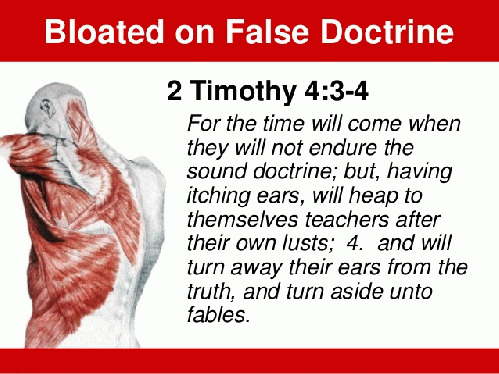 Likewise today it often seems unfathomable that people can continue to fall for the likes of Osteen, Bill Johnson, or Benny Hinn. Then it hits you that they want to believe in what they are selling. They want to believe that God wants them rich beyond their most selfish dreams. They want to believe that God will magically cure them of all ailments with a swipe of someone's sports coat. They want to believe that they themselves are little gods with the power of creation on their lips. The Bible of course teaches us that we must suffer for the cause of Christ. It teaches that healing is within the sovereign purview of God Almighty and sometimes the answer is "my grace is sufficient for you." It teaches that the poison of asps is upon our lips, not the power of divine creation. But that does not stop people from desiring what they want and seeking out teachers that will tell them what they want to hear. Faith is not the problem as they have plenty of faith. It just often is not in God. We often hear the lament of "what's the big deal?" "Who cares if Joel Osteen never preaches repentance? He encourages people!" "Where is the damage?" Today we will answer those questions but first a word from the latest sermonette from Osteen entitled, "Commanded To Be Blessed"
"I will pray for you and also to the patron saint of employment. Sending positive thoughts your way." "Keep believing God always answers prayers from His faithful Son."